Founded in 1999, IMAGE CZ s.r.o. offers products and services related to complex installations in system integration of AV technology. Challenge: RAY Service, a Czech manufacturing company, wanted a new integrated projection system for its boardrooms. 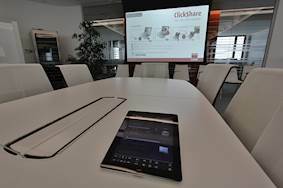 This needed to be able to show the same presentation across multiple screens or each to show discrete imagery, as well as the ability to share imagery from the boardroom to other meeting rooms for when it hosted larger events. Solution: IMAGE CZ was appointed to oversee this complex AV installation and installed four Optoma W306ST projectors with Da-Lite Tensioned Contour screens, Behringer video conferencing microphones and a JAMO ceiling audio system. A Cisco SX20 video conferencing system was discretely hidden using a Ceymsa VL1 ceiling lift. 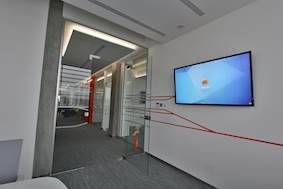 RAY Service, a Czech manufacturing company, was doing a major refurbishment of its head office and wanted a new integrated projection system for its boardrooms. It wanted three projection screens that could switch modes to either show the same presentation across all screens or each to show discrete imagery. It also wanted to be able to share the imagery from this boardroom to a second meeting room on the same floor. With its outstanding reputation, built over two decades, of supplying cable assemblies, electronic equipment and cable components to the military, aviation industry and other industries, RAY Service needed all equipment to work seamlessly together and reflect its high quality brand. IMAGE CZ was appointed to oversee this complex AV installation. 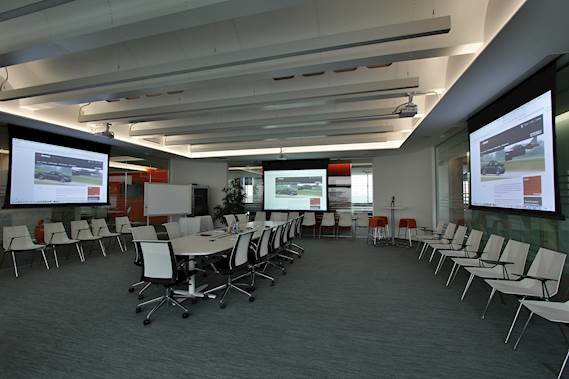 It installed three Optoma W306ST projectors in the boardroom together with Da-Lite Tensioned Contour screens, Behringer video conferencing microphones and a JAMO ceiling audio system. A Cisco SX20 video conferencing system was discretely hidden using a Ceymsa VL1 ceiling lift. And two independent control systems were added to the installation.An RTI RK3 touch panel keypad was affixed to the wall which provides a self-contained system for controlling audio/video components, lights, or other electronic systems. The system could also be controlled wirelessly from the conference desk using an Apple iPad. In addition to the installation in the boardroom, a further W306ST was installed in the company reception area to welcome visitors. The W306ST widescreen short throw projector produces bright, rich imagery for both the education and business environments. It has since been superseded by the next evolution in short throw projection - the W316ST. The short throw lens gives a super-sized 100-inch picture on a screen or wall from just over a metre away which makes it perfect for small meeting rooms or classrooms. Having the projector installed so close to the screen avoids any shadows being cast across the screen from the presenter(s).